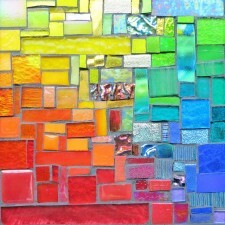 When I discovered dichroic glass and it was love at first sight! The name means “two colors” — layers of coating on the glass allows it to change hue depending the light. Originally created for the aerospace industry, fortunately it was recognized for its beauty and companies now sell it to artists. This new Moonflower Mandala Pendant shimmers between green and violet.